A powerful earthquake hit China’s south-western province of Sichuan killing at least 46 people and injuring at least 400, state TV reports. The US Geological Survey (USGS) said the quake, which had a 6.6 magnitude, was centred 31 miles west of the town of Linqiong. The tremor occurred at a depth of 7.4 miles. The latest quake – initially reported as a 7.0 magnitude, and then at 6.9 – struck at 08:02 local time, the USGS said. The earthquake was felt 71 miles away in the provincial capital, Chengdu, according to China’s state news agency Xinhua. People ran into the streets wrapped in blankets, according to photos posted online. Other pictures showed buildings that had collapsed. A resident in Chengdu told Xinhua he had been on the 13th floor of a building when he felt the quake. The building shook for about 20 seconds and he saw tiles fall from nearby buildings. Electrical and water supplies have reportedly been cut to the affected area. Telephone lines are also believed to be down. Xinhua said 2,000 soldiers had been dispatched to the area to help with rescue efforts. The city of Ya’an, close to the epicentre, has a population of 1.5 million. The USGS noted that “significant” casualties were likely and that “extensive damage is probable and disaster is likely widespread”. “Past events with this alert level have required a national or international level response,” it added. 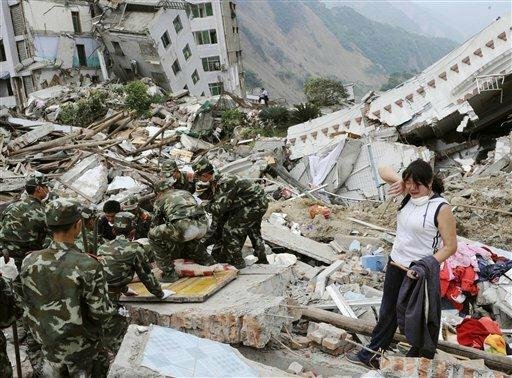 The 2008 disaster in Sichuan left 5 million people homeless.